Traffic was blocked for about two hours Saturday morning after the top of a truck passed under what appeared to be telephone wires in the Windsor Park area. A witness on scene tells ChrisD.ca a Star Building Materials semi-trailer brought down the wires after its boom got caught. Police had the intersection near Speers Road and Maginot Street closed from about 10:45 a.m. onward while crews cleaned up the area. The east side of the intersection was closed to Highway 59, but has since reopened. 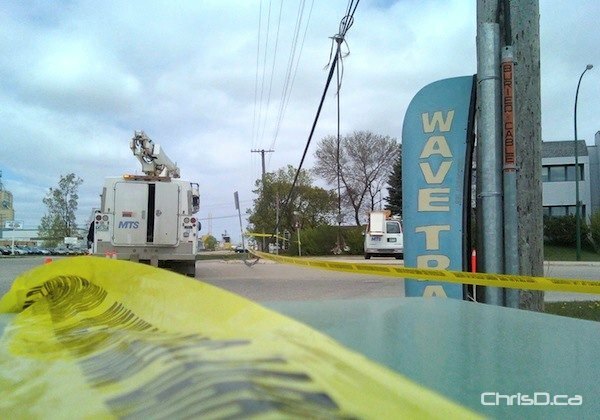 Power in the area appeared to be unaffected.